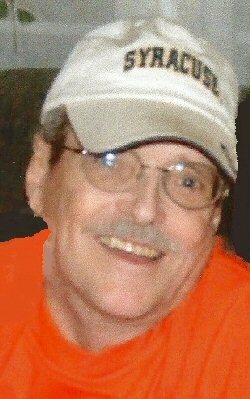 FULTON, NY – A. Peter Scott, 72, of Fulton, died peacefully surrounded by family, on Tuesday, February 5, 2013, at Harrison Methodist Hospital in Fort Worth, Texas. Born in Fulton on April 13, 1940, he was the son of the late Clare and Genevieve Scott of Fulton. Pete graduated from Fulton High School in 1957, attended the Delahaney Institute of Technology in Long Island and worked at Black Clawson until he retired in 2002. Pete was an accomplished bowler and was inducted into the Fulton Bowling Hall of Fame in May 2003. Pete was also a lifelong member of the Elks Club and an avid New York Giants fan. Pete is survived by his children, Rick (Michelle) Scott and Bill Zischke of Fort Worth Texas, Gidget (Joe) Stevens, Donna (Frank) Barbagallo and Diane (Kevin) Blasczienski all of Fulton; brothers, Phillip Scott of Fulton and Paul Scott of Oxnard, Calif.; sister, Sheryl Knight of Fulton; 16 grandchildren; and two great-grandchildren. Memorial calling hours will be Saturday, February 23, from noon to 4 p.m. with family and friend remembrances beginning at 4 p.m. at Foster Funeral Home, 910 Fay St, Fulton. We’re so sorry for the family at the passing of Pete. You have our sincere sympathy and apologies for not attending any services as we are out of state until March. You will be forever loved and missed by many!! All of the Places want to say how sorry we are for your loss. I cannot tell you how often we think about you kids and your parents from all those years ago when you were part of our lives. Pete will be missed I know…but will be stronger and better thanks to the love he got from all of you…Peace..